Some Like it Hot! Sweet! Spicy! February’s foods reflect the fire and passion that take the chill out of a short but bitter month. Of course, February also conjures up the color red. There are all shades of red, from the bright red of peppers (both hot and sweet), as well as the ripe tomatoes of long-forgotten summer, to the medium reds of red-skinned potatoes, pears, and apples, to the reddish brown of cinnamon, and finally, to the deep reds of grapes and beets. Chili peppers are not really peppers; they come from the same family as eggplants. Either way, they can be very hot to the palate and fingers, so I warn you to use this plant food with caution. These red hots can burn the skin if you try to remove the seeds without gloves, which I did when I volunteered one weekend in a kitchen where my daughter was going to camp. I literally burned my fingertips when I cut chilies and removed the stems without gloves. I had to submerge my hands in yogurt and ice cubes for a long time to remove the sting. Depending on the region, the word can be spelled chile or chili. Incidentally, cayenne pepper is a true, hot red pepper used to flavor dishes; its name comes from the city of Cayenne in French Guiana. Its powdered form comes from the fruit of several cultivated varieties of the capsicum plant, also related to the nightshade family. For a complete list with photos of chilies and their degree of heat, please click onto http://users.visi.net/~mandy/pepguide.html. According to this website, peppers may have some beneficial properties. Capsaicin (the compound in peppers) works as an anticoagulant, possibly helping to prevent heart attacks or strokes caused by a blood clots. Small amounts of capsaicin can produce numbing of the skin with aslight anti-inflammatory effect. In some countries, these peppers are used in salves. In addition, all peppers are high in vitamin C, an antioxidant which helps remove the threat from free radicals. Hot peppers contain even more Vitamin C than their bell pepper counterparts; but of course, you may eat much less of these hot babies. Also, red peppers are a good source of beta-carotene. Cinnamon is a small, evergreen tree native to Sri Lanka and Southern India. It is actually the bark that we use as a spice. The flavor of cinnamon comes from the aromatic essential oil, which makes as much as 0.5 to 1% of its composition. (The oil is often found in health food stores and is very potent.) Cinnamon has been known from ancient times, and was so highly regarded that it was used as a gift for monarchs. What the previous paragraph points out me is that we have to be careful to purchase true cinnamon, especially if the link between cinnamon and cholesterol proves to be important. Since cinnamon is probably my favorite baking spice, I am willing to investigate this caveat further. In the meantime, try cinnamon in your yogurt, applesauce, and baking. Below are my recipes for â€œheating, spicing, or sweetening up” your February dishes. 1. 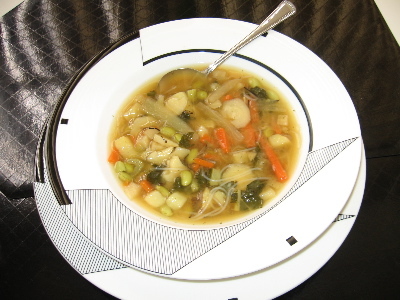 Place the prepared vegetables of choice into water in a soup pot. Add garlic and parsley and dill, if using. Bring to a gentle boil and then simmer until veggies are tender. 4. Wait a few minutes and taste. If you want the soup spicier, add another pinch of cayenne and wait again to taste. Variation: Add shelled and cooked edamame beans (green soybeans). Add rice stick noodles, cooked according to package directions. Add arame seaweed, soaked until soft and then drained. 2. Toss potatoes with one tablespoon olive oil in a baking pan that has been coated with another tablespoon of olive oil. 3. Bake the potatoes until tender and slightly crisp, about 45 minutes to one hour. About 40 minutes into the baking, steam green beans and set aside just until you remove potatoes from oven. 4. 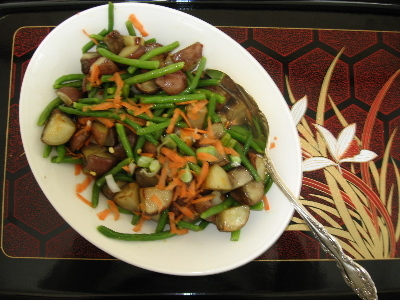 Place potatoes in a large bowl. Toss with chili pepper seeds (I used about 30) or a couple of pinches of cayenne pepper powder. Add green beans and toss again. Serve right away, although any leftovers can be served cold the next day, but may need another spoonful of oil tossed into the dish. 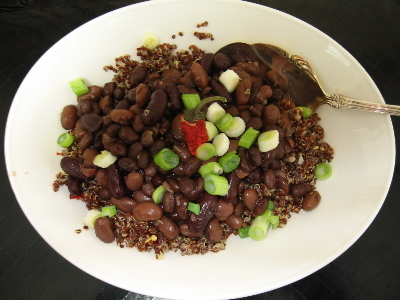 Chili Beans over Rice (This is a quick recipe, especially if you have rice in the â€˜frig. from the day before.) I used organic, canned beans because there were several varieties in one can (pinto, kidney, and black), difficult to reproduce by using the individual beans in dry form, especially since I am the only one eating this dish! 3. Place cooked quinoa in a serving bow. Mix in the beans and taste. Adjust pepper flavor carefully. Serve hot and spicy! 1. Melt chocolate in a double boiler (Or one small pot over one larger pot with boiling water). 2. As it melts, add a dash of hot pepper and about one teaspoon cinnamon. 3. Allow to cook a few seconds and taste. Adjust flavor to your palate. Remember, hot peppers can be very hot, so use sparingly. Same goes for cinnamon. Better too little than too much, since you can always add more. 1. Preheat oven to 375 degrees. Oil two cookie sheets. 3. In a larger bowl, mix all the dry ingredients except the extra fructose, and flour. Then pour wet items into larger bowl and mix thoroughly, so that you have a pebbly texture. 4. Slowly add hot juice until flour mixture begins to pull away from the bowl. The dough will be wetter than piecrust but drier than drop cookie dough. 5. Flour your work surface; take half the mixture and roll the dough about 1/2″ thick. 6. Use a cookie cutter to cut out cookies and place on a slightly oiled cookie sheet pan. 7. Bake at 375 degrees for about 15 minutes, or until the cookies begin to look crisp around the edges. 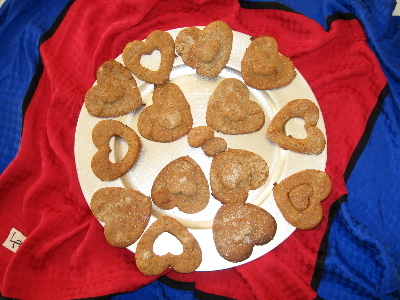 Note: My heart cookie cutters are about 3 inches across, so my yield was less than 2 dozen. Smaller cookie cutters should give you at least 2 dozen cookies. This entry was posted on Thursday, February 8th, 2007 at 10:39 am	and is filed under Kitchen Nutrition. You can follow any responses to this entry through the RSS 2.0 feed. You can skip to the end and leave a response. Pinging is currently not allowed. Ӎy brother suggested I might like this website. Hе was totally right. This post truly made my day. You cann’t imagine simply how mսch timе I had spent for this information!